The link between man, religion and landscape is vividly seen here in the Himalayan Kingdom of Nepal. Nowhere is this link so vital and embodies the whole of life and the passage into the hereafter, of earthly life and heavenly life. Travelling through this magnificent country, with the high peaks constantly dominating the landscape, one is reminded of this through the variety of religious sites and sounds, the colours of the five elements, Red, Green, Yellow, Blue and White, and the day to day observance of the influences of the Hindu religion. Having travelled and viewed other high places I find that here is the embodiment of the “Tingle zone”. This is that area, or horizon where the physical world meets the spiritual world. 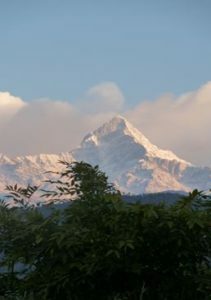 The Himalayas act as a bridge from the physical world in which we are born, live and ultimately die to the spiritual world. I feel that these mountains belong to the Gods. Reading the exploits of Everest climbers brings home not only the great physical challenges and dangers but also the immense and necessary mental and spiritual efforts needed. The final thousand feet to the summits are not for mere flesh and blood, for the climbers must rise above their own human frailties, for only a power within them and without them will they overcome the challenges to attain their ultimate goal. From the populated fertile lowlands and the rolling foothills the Himalayas rise above all. The “Himalayas” is a word from the Sanskrit meaning the “Abode of snows”. The physical world is home to man. These pristine worlds of ice and snow and where the air is clear and sharp, are the high places, where man cannot survive easily, are always there in the sight or in the mind of those who live out their lives in this region. The sun slowly setting changes the colours of the high peaks from pink to lavender and on to purples before attaining the inky cobalt blues of the high altitude skies. Even in the almost total darkness with its cold black velvet night, and during the magical transformation of the early morning sun and the golden hues giving way to the oranges and yellows and ultimately of the silver peaks of the mountains all combine to enhance the spiritual experience. The ever presence of “light and dark” with its philosophical implications, its relationship with life and death, with the balance between the known and unknown also plays into the mind. 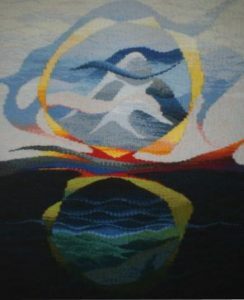 Read More About "These Mountains Belong to the Gods"
This series of tapestries examines much of the relationship between the physical landscape and the spiritual world. The “pathway to enlightenment” which embodies the cyclical life journey through birth, life, death and ultimately rebirth has occupied the thoughts and minds of countless followers of the Hindu and the Buddhist religion. The concepts of the “barrier” or the hurdles of ultimately making this transition are legion, some physical some psychological. These ideas are embodied in the many temples, sacred sites with their myriad stone carvings and friezes, along with the mesmerising sights and sounds of the prayer wheels kept rotating by the hands of devotees. The other sight which I found stunningly simple but beautiful through its application is that of the “wind prayer flags”. These long strings of repetitive red, green, yellow, blue and white fabrics, printed with prayers are stretched between trees, on roadside bushes and used to decorate major buildings and temples and flutter, flap in the breeze. Many of the designs incorporate the pathways through and beyond the religious barriers to the ultimate life cycles of the Hindu and Buddhists religions. 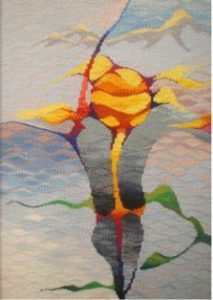 As a metaphor I have used the rolling, folding landscape forms of the lower slopes where man has created a living environment. These interlocking shapes are also echoed in the depiction of fire with its importance for the continuing after life through the cremation ceremonies and the giving of the remains to the sacred waters of the Ganges. During my travels through Nepal the rich fertile land surrounding the villages, farms and hamlets I was struck by the vast skies and the majestic cloud formations. The road system and the pathways although extensive with many rickety bridges spanning deep gorges seemed always busy with motorised traffic and people walking, many with heavy loads. Of heavily laden bicycles and motor scooters, of donkeys and horse drawn wagons, it is a busy bustling place. But there was always, high up above the immediate horizon and the clouds, was this other visible world. The high places seemed to belong to another place. It was so high and far, the peaks a pattern of snow and rock stretched along this other horizon. At times the cloud and lower mists obscured this other land but I was very much still awareness of its presence. Just because it was unseen, invisible its presence was tangible and there was something of relief when the sky cleared and the tops came back into view. It made me wonder if what I was viewing was real and physical or was it in my mind, a psychological occurrence. It sent shivers up my spine and was akin to the feelings I had experienced in the great nave of the cathedral at Chartres or in other western European Gothic edifices. If this is spiritual then I most certainly was receptive to these events. “A faint indistinct outline of the high mountains, blue against the blue of the horizon. It was so far away that it seemed an illusion, insubstantial and ethereal, it was of mist and air rather than of earth and rock. “The mountains have that aura of beauty that needs no words. 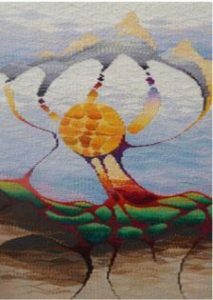 These thoughts and concepts for the four tapestry designs are the results of our four visits to Nepal and the High Places.